Ani And London Crew At Karma Kitchen! Ani rocked the house at London Karma Kitchen, with a full crew of 16 SSp London volunteers, a handful of cafe staff-come-volunteers including the owner Ruth who as at our last one-day retreat :) who shared beautiful tweets like this and this, a professional head-chef-come-head-volunteer for KK (and his mother-in-law who was his assistant! ), Milan Rai our favourite white butterfly artist who joined as a guest speaker, and 80+ diners across two sittings! 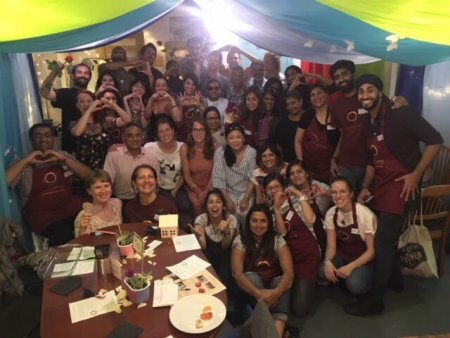 She amazingly laddered the entire unfolding of magic and inspiration at Karma Kitchen this time while onboarding two new local KK London anchors, Amar and Chi! Ani, you are beyond amazing!!! Yep, I think the word is beyond amazing. A big hug to everyone, what an amazing group of beautiful souls. Awesome to hear this quick recap of KK London. Go Anididi! Indeed Ani rocked it! and so did all the wonderful volunteers :-) Thank you!! !